I know you can change it all in an instant. I know how you can feel terrified, scared, alone, and mad all at the same time, seeing no way out, and then the next second, a bright, sharp sliver of light is so powerful, it has the power to put a slice right through all of that heaviness. When you are feeling all of that heaviness, you simply can’t lift your head to see light. All you see is the tragedy of the moment. All the pain, and the hurt. And, sometimes, we need to feel that and work through that. But, we also need hope to give us the strength to move through it, and in those dark moments, it’s really difficult to find hope. I was shown how to find hope by someone else, and it only takes a second. The hardest part is wanting to find hope in those dark moments. It seems so damn elusive! But, once you realize your own power to find it, it is the most empowering feeling ever. I’ve told the blue folder story in a few blog posts, and I brought it up at a meeting on Wednesday. That story is an old one now, over 7 years old, but I realized telling it again Wednesday how much power it still holds. I won’t go through the full story again, most of you have heard or read it, but I will share the essence of it, because it is how I learned to find my own way through the dark tunnel to the bright side. 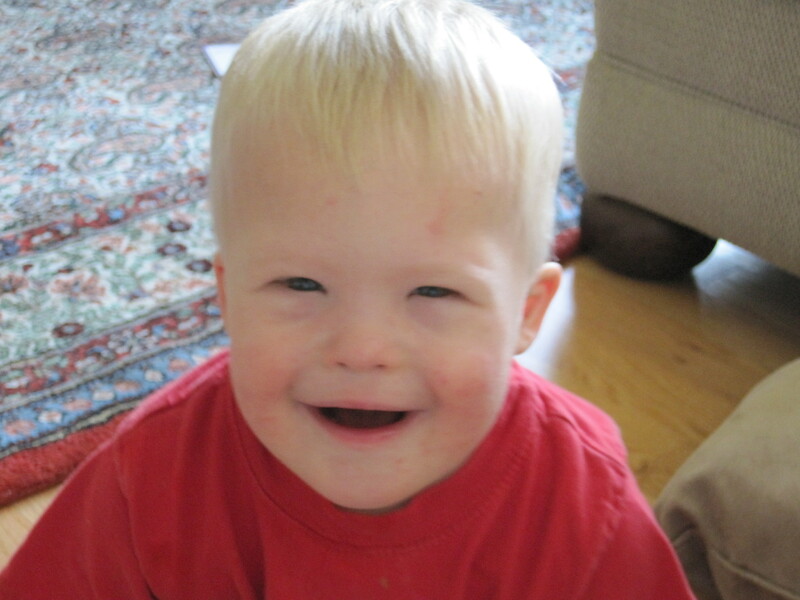 Very shortly after Wil was born, and we learned he had Down syndrome, we felt a very heavy, and unexpected loss. The loss of the hopes and dreams we all have for a healthy, happy baby. Knowing very little about what Down syndrome meant, it was extremely overwhelming, and all I could see was dark. There was no light, no hope. A little later that day, I was laying in my hospital bed, and a social worker walked in to speak to me holding a blue folder. I knew it was full of medical jargon about Ds, and she was there to make me feel better, and frankly, I didn’t want to feel better. I was too wrapped up MY loss. Yes, MY loss. Wil had not lost anything. He gained. He gained an extra chromosome, and I had no idea yet how much our family would gain with him in our lives, but that was still to come, and I just couldn’t and wouldn’t open my mind to see that those short hours after his birth. Instead of opening the folder, this woman smiled at me, held it up, and on the cover was a close up of a beautiful blond girl, with the biggest blue eyes that were so bright, you couldn’t help but stare and be lifted up into them. This little girl had Down syndrome. “Isn’t she beautiful?” The social worker said to me, and I had to agree, yes, yes, she was. I was mesmerized. I will never forget those little girls eyes. She was beautiful, and not just in the physical sense, I can only describe it as her soul was beautiful, and that was enough for me. My son’s soul would be beautiful, too, and that was my light, my newfound hope. Just moments before, I was in a very dark place, and now I had hope. And, nothing had changed at all except for my perspective. I was still laying there in my hospital bed like I was moments before, and my son still had Down syndrome. I still had a huge learning curve and challenges ahead of me. The only difference now was I could see the brightness above the struggles. I could find a slice of joy in the situation, and over time that would grow, and I would grow. I didn’t know all of that then, but I had the biggest tool of all. The knowledge of the power I had within me to change my perspective on a dime. Struggles and challenges are not over for any of us. That’s just life. That’s just being human. But, we all can find hope, and we can find it in a second, and staying focused on that light determines the quality of our lives. It’s not easy, no one promised life would be. But, easy is not always good. Sometimes our best lives our discovered in our darkest hours.